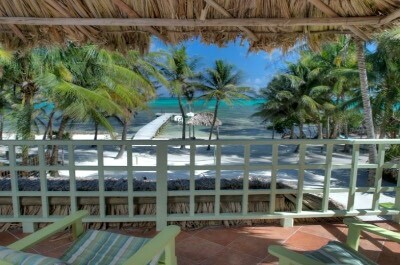 Read on for the best San Pedro Belize hotels, the main getaway on Ambergris Caye, that is sure to fit everyone's budget. Families searching for a fun atmosphere with a water park should stay at the Caribbean Villas Hotel. Travelers looking to stay on the beach with easy walking access to downtown can book at the SunBreeze Hotel, Banana Beach Resort and Caye Casa is a splendid choice for an in town boutique hotel. The White Sands Cove Resort, Mata Rocks Resort and the Ocean Tide Beach Resort are great places for people searching for a quiet laidback atmosphere. Families looking to provide more home cooked meals will find condominium suites with kitchens at the Banyan Bay Suites, Grand Colony Island Villas and the La Beliza Resort will provide you with more seclusion. If you are seeking a mid-range San Pedro Belize hotel that is perfect for everyone including families and offers easy beach access then you should stay at the SunBreeze Hotel. Located in the heart of San Pedro along the coastline of Ambergris Caye, the SunBreeze Hotel is situated on a nice stretch of sand and is 5.5-miles from the Hol Chan Marine Reserve. The SunBreeze Hotel has a modern two floor architectural style with Mediterranean accents which houses 43 rooms and suites that have a beach decor. Standard, Deluxe and Premium rooms are sized similar with a choice of bedding and offer a view of the courtyard, pool or Caribbean Sea. Family rooms are more spacious with a variety of bedding options and have views of the courtyard, pool or sea. The SunBreeze Hotel has a nice spot on the beach where you can lounge or go swimming. You can arrange for your favorite watersport activity onsite. The SunBreeze San Pedro Belize hotel offers easy access to the attractions of San Pedro which include the Ambergris Museum, the Belizean Melody Art Gallery and the Toucan Jumper Bungee Trampoline. The SunBreeze Hotel has a freshwater swimming pool and there is a full service spa onsite. Dining onsite includes the Blue Water Grill which serves all three meals and you will find a plethora of dining options within walking distance that includes Delices de France, Caroline's Cookin' and Wild Mango's. Nightlife nearby includes the Playa Bar and Grill and Wahoo's Lounge for live music. 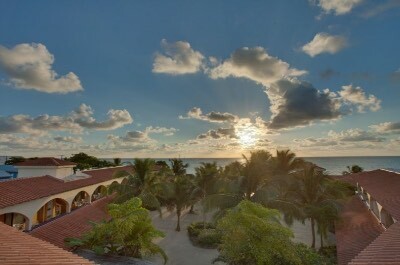 When you are looking for a boutique all-suite San Pedro Belize hotel that is ideal for all types of travelers including families and offers plenty of complimentary amenities then the White Sands Cove Resort is superb. 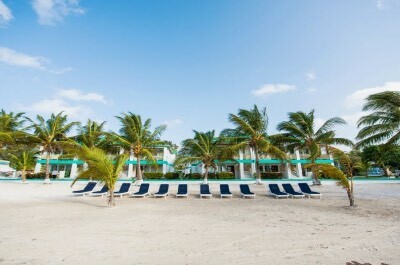 Located 2.5-miles north of San Pedro along the coastline of Ambergris Caye, the White Sands Cove Resort is situated within a manicured garden and is 2.5-miles away from Secret Beach. The White Sands Cove Resort has a unique modern two story architectural design with 14 condominiums that sport a beach interior. One-bedroom condominiums have several floorplans which start at 548 square feet with a choice of bedding, a separate living room, kitchen and a private balcony with views of the pool or the sea. There are several floorplans available in two-bedroom units that start at 1,080 square feet with a choice of bedding options, a separate living room, kitchen, dining area, 2-bathrooms and a balcony with pool or Caribbean Sea views. The White Sands Cove Resort San Pedro Belize hotel does not offer a beach but there is a pier where you can go snorkeling or swimming in the sea. The property offers complimentary use of kayaks and you can rent watersport equipment onsite. The White Sands Cove Resort San Pedro Belize hotel offers free use of bicycles to help you explore San Pedro where you will find the Central Park, Ambergris Museum and you are less than 3-miles from the American Crocodile Education Sanctuary. There is a freshwater swimming pool and a children's pool as well as a full service spa onsite. Dining starts with a home cooked meal and the White Sands Cove Bar and Grill is open for lunch as well as dinner poolside. Nightlife can include a trip to San Pedro where you will find Feliz Bar and Grill as well as Wayos Beach Bar. If you want to find a family friendly all-suite San Pedro Belize hotel that has great beach access and offers plenty of onsite amenities then you should stay at the Banyan Bay Suites. Located south of San Pedro along the southern coastline of Ambergris Caye, the Banyan Bay Suites is directly on the beach along the Banyan Bay and is less than 5-miles from the Hol Chan Marine Reserve. The Banyan Bay Suites has a modern two floor architectural style with Colonial accents and 35 one, two as well as three-bedroom suites that feature a contemporary decor. One-bedroom suites have 906 square feet with a separate living room, full kitchen and private balcony that boasts views of the pool, beach or Caribbean Sea. Two-bedroom suites are sized at 1,100 square feet with a choice of bedding, separate living room, dining area, full kitchen, 2-bathrooms and private balcony with views of the beach, sea or pool area. Three-bedroom suites are 1,400 square feet with a choice of bedding, a living room, dining area, full kitchen, 3-bathrooms and a beachfront view. The Banyan Bay Suites has a nice beach area where you can relax, swim or snorkel and you can arrange for your favorite watersport adventure onsite. The Banyan Bay Suites have a great spot to start your adventures with a 25-minute walk to San Pedro where you will find the Belize Chocolate Company, the San Pedro House of Culture and the San Pedro Belize Express Dock. The property offers free use of bicycles to make your commute easier. The Banyan Bay Suites has numerous activities for families from corn hole to bocce ball to horseshoes to beach volleyball and there is a children's wading pool as well as a snorkeling area. The hotel offers a three-tiered freshwater swimming pool with poolside service and there is a full service spa. Dining onsite includes a home cooked meal in your suite as well as Rico's Bar and Grill for all three meals. Options offsite for eating include Casa Picasso, the Coconut Cafe and Robin's Kitchen. Nightlife can be found within walking distance that includes live music at the Roadkill Bar or Coco Loco's Beach Bar. If you are searching for a quiet boutique San Pedro Belize hotel that offers value and is ideal for all types of travelers including families then the Mata Rocks Resort is superb. Located within a 30-minute walk from San Pedro on the shoreline of Ambergris Caye, the Mata Rocks Resort is situated directly on the beach and is only 4.5-miles away from Hol Chan Marine Reserve. Mata Rocks Resort has a modern two story architectural design with 17 rooms and suites that have a trendy beach interior. Rooms are sized between 279 to 302 square feet with a choice of bedding and a private balcony that offers direct pool access or views of the Caribbean Sea. Junior suites are 452 square feet with an open floorplan that includes a sofa, kitchen and private balcony with sea front or sea views. The Mata Rocks Resort has a nice spot on the beach where you can relax as well as swim and you can arrange for watersport activities like snorkeling onsite. The property offers free bicycles so you can easily go to San Pedro where you will find the Central Park, Belizean Melody Art Gallery and the Ambergris Museum. The Mata Rocks Resort San Pedro Belize hotel has a small freshwater swimming pool with a sundeck and pool/beach bar as well as a dock. There is not a fitness center or spa onsite. Dining includes a complimentary continental breakfast and the Squirrel's Nest serves light snacks pool/beach side. Offsite dining options include Robin's Kitchen, the Hidden Treasure Restaurant and the Baker. Nightlife includes Island Time Bar and Restaurant and the Crazy Canucks Beach Bar features live music. If you are seeking a kid friendly mid-range San Pedro Belize hotel that has plenty of amenities for children including a unique water park then you should try the Caribbean Villas Hotel. 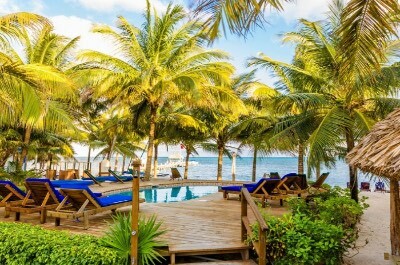 Located within a 10-minute walk to downtown San Pedro on the coastline of Ambergris Caye, the Caribbean Villas Hotel is situated on 3.6-acres of tropical gardens and is a quick 20-minute to the San Pedro Belize Express Dock. 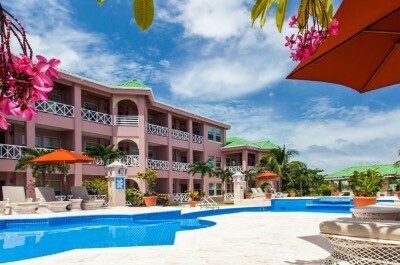 The Caribbean Villas Hotel has a unique modern four floor architectural style with Mediterranean accents that houses 60 rooms and suites which boast a contemporary beach decor. Standard rooms have 267 square feet with a queen size bed, a small kitchenette (microwave and refrigerator) and a sitting area (no balcony). Deluxe rooms are sized at 344 square feet with a choice of bedding and a private balcony that has a view of the Caribbean Sea. One-bedroom suites have 452 square feet with a separate living room, dining area, full kitchen and a large veranda with sea views. There are three styles of loft suites that feature a choice of bedding options, 1 or 2-bathrooms, a full kitchen, living room, dining area and a private balcony with sea views. The Caribbean Villas San Pedro Belize hotel has a perfect place on a 250-foot private beach which includes a 300-foot dock that has an artificial reef and snorkeling area at the end. You can arrange for your favorite watersport adventure at the onsite dive shop. You are a short distance to the Belize Chocolate Company for shopping and you are less than 5-miles away from the Hol Chan Marine Reserve as well as a one hour drive from Secret Beach. The Caribbean Villas Hotel has the only water park on Ambergris Caye which includes a waterslide, trampoline and assorted water activities such as a zipline over the sea. 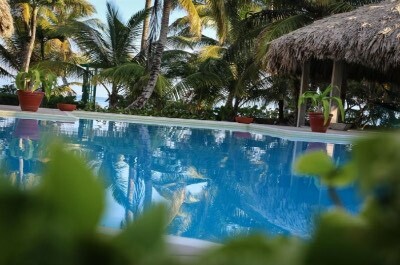 There are two freshwater swimming pools, the Belize Sailing School and massages are available. There is not a fitness center. Dining at the Caribbean Villa Hotel includes Amber Beach Bar and Grill for all three meals. Offsite dining within a short walk includes Ammore'Pasta, Caroline's Cookin' and the Hungry Grouper. Nightlife nearby can be found at Havana Cigars and there is live music at Wayos Beach Bar. When you are searching for a mid-range San Pedro Belize hotel that is perfect for all types of travelers and offers easy beach access then you should stay at the Banana Beach Resort. Located just south of San Pedro along the coastline of Ambergris Caye, the Banana Beach Resort is situated directly along Mar de Tumbo Beach and is 4.5-miles away from the Hol Chan Marine Reserve. The Banana Beach Resort has a modern three story architectural design with Mediterranean accents that contains 62 rooms and suites that boast a basic beach interior. Veranda rooms are sized at 247 square feet with a choice of bedding and a private balcony with pool views. One-bedroom suites have 602 square feet with a separate living room, full kitchen and views of the courtyard, pool or Caribbean Sea. There are options to combine rooms to make two, three or four-bedroom suites that can accommodate any size family or group. The Banana Beach Resort has a great spot on the Mar de Tumbo Beach where you will find plenty of sand and watersport activities such as snorkeling, scuba diving and kayaking as well as good swimming. The Banana Beach Resort is less than 10-minutes by foot to the Black and White Cultural Entertainment Center, 20-minutes to the San Pedro Belize Express Dock and 1-mile away from the American Crocodile Education Sanctuary. You can also arrange for additional adventures onsite with the hotel's tour agency. 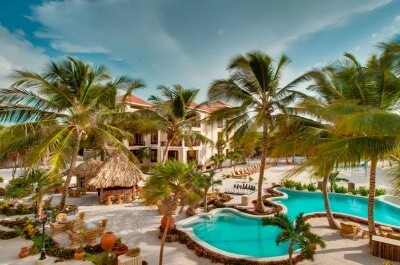 The Banana Beach San Pedro Belize hotel has two freshwater swimming pools but there is not a fitness center or spa. Dining onsite includes El Divino Caribbean Steakhouse and Martini Bar and you have several options within a short walk that include Casa Picasso, the Coconut Cafe and Delices de France. Nightlife includes a martini at El Divino and you can find live music at Amber Beach Bar and Grill which is within walking distance. When you are looking for an all-suite San Pedro Belize hotel that is great for families and boasts several resort style amenities then the Grand Colony Island Villas is perfect. Located just south of downtown San Pedro along the Ambergris Caye shoreline, the Grand Colony Island Villas are situated directly on the beach along Banyan Bay and boasts an easy 25-minute walk to the San Pedro House of Culture. The Grand Colony Island Villas have a modern three floor architectural style with 14 two and three-bedroom condominiums that feature a contemporary decor. Two-bedroom villas have 1,100 square feet with a choice of bedding, a separate living room, a full kitchen and a private balcony with views of the pool area or Caribbean Sea. Three-bedroom villas have 2,400 square feet with a choice of bedding, a separate living room, multiple bathrooms, a full kitchen and a view of the beach or pool area from a private balcony. The Grand Colony Island Villas have a nice beach area along Banyan Bay where you will find plenty of sand for lounging, watersport activities like kayaking and you can arrange your favorite adventure onsite. The Grand Colony Island Villas San Pedro Belize hotel are a short walk away from many attractions such as the Black and White Cultural Entertainment Center, the Belize Chocolate Company for shopping and you are 4.5-miles away from the Hol Chan Marine Reserve. The Grand Colony Island Villas has plenty of activities for children including a wading pool and snorkeling area on the beach. The property has a three-tier freshwater swimming pool but there is not a fitness center onsite. Dining at the hotel includes a home cooked meal in your villa or you can visit Rico's Bar and Grill at Banyan Bay for all three meals. Dining offsite within walking distance includes Robin's Kitchen, the Baker and Hidden Treasure Restaurant. Nightlife can include live music at Rico's or you can take a short walk to Roadkill Bar and the Crazy Canucks Beach Bar. If you are seeking a small condominium style San Pedro Belize hotel that offers direct beach access and a relaxing atmosphere for all types of travelers including families then the La Beliza Resort is superb. Located 8-miles north of San Pedro in the Ambergris Caye, the La Beliza Resort is situated directly on a pristine beach area and is a quick 25-minute water taxi to the mainland. The La Beliza Resort has a modern Mediterranean three story architectural design with 18 one and two-bedroom condominiums which feature a contemporary interior. One-bedroom Lanai units have 1,135 square feet with a separate living room, full kitchen and a private balcony that overlooks the Caribbean Sea. Two-bedroom Veranda suites have 1,550 square feet with a separate living room, a full kitchen, 2-bathrooms and a private balcony with views of the sea. Grand Villa suites are sized at 1,669 square feet with 2-bedrooms, 2-bathrooms, a full kitchen, a separate living room and a private balcony with sea views. The La Beliza Resort has a nice beach area for lounging as well as for swimming and you have access to complimentary kayaks. You can arrange onsite for other watersport adventures like fishing, snorkeling or a glass bottom boat ride. The La Beliza Resort requires a drive to San Pedro where you will find shopping at the Belize Chocolate Company, sky diving and ACES/American Crocodile Education Sanctuary. The La Beliza San Pedro hotel has an Infinity freshwater swimming pool that overlooks the Caribbean Sea, a rooftop terrace, fishing pier and a full service spa onsite. Dining includes a leisurely home cooked meal in your suite or you can visit the La Beliza Island Resort Restaurant for all three meals. Offsite dining requires a short drive where you will find the Truck Stop, Casa Picasso and Stella's Smile. Nightlife involves a drive to San Pedro where you can indulge in drinks at the Crazy Canucks Beach Bar, Wayos Beach Bar and the Roadkill Bar. If you are searching for a mid-range boutique San Pedro Belize hotel that has a relaxing atmosphere and easy beach access then the Ocean Tide Beach Resort is ideal. Located in the northern section of San Pedro on Ambergris Caye, the Ocean tide Beach Resort is situated directly on Boca del Rio Beach and offers an easy 10-minute walk to the Ambergris Museum. The Ocean Tide Beach Resort has a modern three floor architectural style with 11 rooms that sport a contemporary beach decor. Rooms are sized at 269 square feet with a choice of bedding and each room offers a view of the ocean from a shared patio deck. 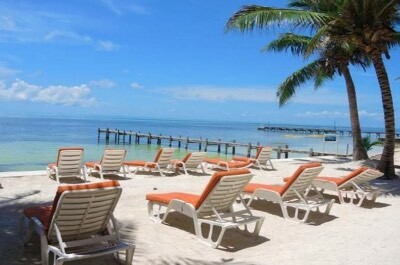 The Ocean Tide Beach San Pedro Belize hotel has a perfect on Boca del Rio Beach where you will find plenty of sand, swimming and there are a plethora of watersports adventures available that range from standup paddleboarding to snorkeling to scuba diving to parasailing. The Ocean tide Beach Resort is within walking distance to many attractions which include the Central Park, the Belizean Melody Art Gallery and San Pedro Town Hall. The property has a freshwater swimming with a sundeck that overlooks the ocean and there is a poolside bar. The resort does not feature a fitness center or spa onsite. Dining onsite includes meals at the Lazy Pelican Beach Bar and you can find several restaurants within walking distance such as the Finn and Martini, Caramba Restaurant as well as Elvi's Kitchen. Nightlife is a short walk away at the Playa Bar and Grill, Coco Loco's Beach Bar as well as Feliz Bar and Grill. If you are searching for an upper-mid-range boutique San Pedro Belize hotel that boasts a quiet atmosphere and is ideal for couples then the Caye Casa is perfect. 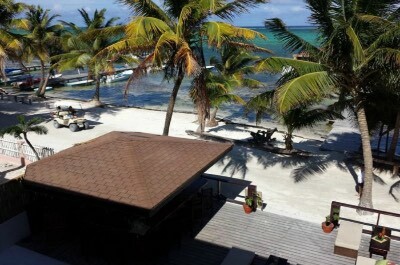 Located on the northern outskirts of San Pedro on Ambergris Caye, the Caye Casa is situated steps from Boca Del Rio Beach and is only 6-miles away from the Hol Chan Marine Reserve. The Caye Casa has a modern beach two story architectural design with 8 rooms and suites that feature a bright beach interior. Classic rooms are 215 square feet with a queen size bed and some rooms offer a private balcony that has views of the pool or ocean. One-bedroom Casitas have 452 square feet with a king size bed, a separate living room, a small kitchenette (microwave and refrigerator) and a terrace that boasts a view of the pool or ocean. One and two-bedroom Villas start at 645 square feet with a separate living room, dining area, full kitchen, a choice of bedding, multiple bathrooms and private terrace with ocean views. The Caye Casa has a small private beach that is steps from the property where you will find space to relax and the swimming is good. There are plenty of watersport adventures in the area with excellent snorkeling and scuba diving within a short distance from Caye Casa San Pedro hotel. Neraby attractions are short drive or boast ride away which include the Black and White Cultural Entertainment Center, Shark Ray Alley and Toucan Bungee Trampoline. The property has a small plunge pool but does not offer a fitness center or spa onsite. There is no restaurant onsite and dining options within an easy walk include the Melt Cafe, Delices de France and the Hungry Grouper serves Caribbean style cuisine. There is plenty of nightlife within walking distance that includes Wahoo's Lounge, Havana Cigars and Wayos Beach Bar.